The mixture of a date, a name, and a location come rushing at us in the news today, to remind us to not let our twilight language guard down. On June 19, 1982, the dead, limp body of God's Banker, Roberto Calvi was found hanging beneath Blackfriars Bridge in London. 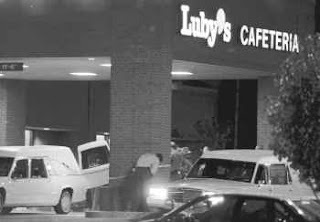 Before George Jo Hennard crashed his truck into Luby's Cafeteria in Killeen, Texas, on October 16, 1991, and sprayed it with gunfire. killing 23, including himself, wounding 20, he had watched a documentary video at home about a similar scenario carried out by James Oliver Huberty, who killed 21 people and wounded 19 at a San Ysidro, California, McDonald's on July 18, 1984. Huberty was shot dead at the McDonald's by law enforcement personnel. On March 1, 2000, a man opened fire at a Burger King and a McDonald's in Wilkinsburg, Pennsylvania, killing 3 and injuring 2 others. On May 24, 2000, a Queens. New York, Wendy's was shattered by gunfire that left 5 dead and 2 wounded. On January 20, 2003, a man walked into a Burger King in Pomona, California, killed 2 and was shoot by police, in what was called a "suicide by cops." 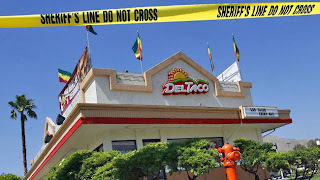 A man walked into a Southern California fast food restaurant and shot his stepdaughter and her family of four as they ate lunch together, killing the woman's husband and 8-year-old son before fatally shooting himself Saturday afternoon, June 19, 2010, one day before Father's Day. 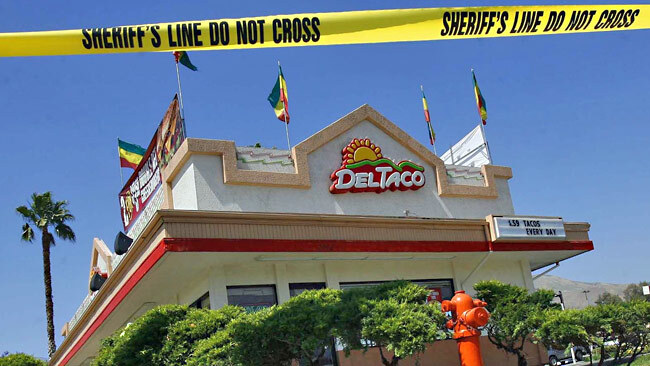 The gunman, who was identified as Jimmy Schlager, 56, of Lancaster, rode a bicycle to the Del Taco restaurant restaurant in San Bernardino, California, before opening fire at his family, who were having lunch. The name Schlager is German, and is loosely translated as a "hit," formerly, as in a "musical hit." There are apparent records of Schlager having a criminal record of some violence. Both his stepdaughter, 29, and her five-year-old son sustained multiple gunshot wounds and were taken to hospital in critical condition. His stepdaughter's 33-year-old husband and his six-year-old son died from their wounds. Schlager arrived at the Del Taco restaurant in San Bernardino on a bike at about 1 p.m., walked over to a table and opened fire on his stepdaughter, her husband, and their sons, San Bernardino police Lieutenant Jarrod Burguan said. While the motive remains unclear, authorities believe "there’s a domestic connection," Burguan said. Witnesses offered the police "very vague" accounts of what Mr. Schlager said to the family, Burguan said: "Something to the effect of, ‘Well, what do you think of me now?’"
The woman's husband, 33, was declared dead at the restaurant and the 8-year-old was declared dead at a hospital, San Bernardino Fire Department spokesman Steve Tracey said. The woman and the 6-year-old boy were hospitalized in critical condition, Tracey said. Police said several other people were in the restaurant, but the gunman clearly walked in seeking the four victims. They said the gunman had a long and violent criminal record, but did not give further details. Owners of nearby businesses said horrified patrons streamed out of the restaurant after the shots were fired. "I saw some people yelling and all of a sudden I heard 'boom, boom, boom, boom'," Jorge Garcia, who works at a recycling trailer in the same parking lot as the restaurant, told the Riverside Press-Enterprise. "I saw two employees run out of the employee door and then I saw eight or 10 people run out of the restaurant and across the street." What will the next week deliver to our consciousness via forthcoming breaking headlines? 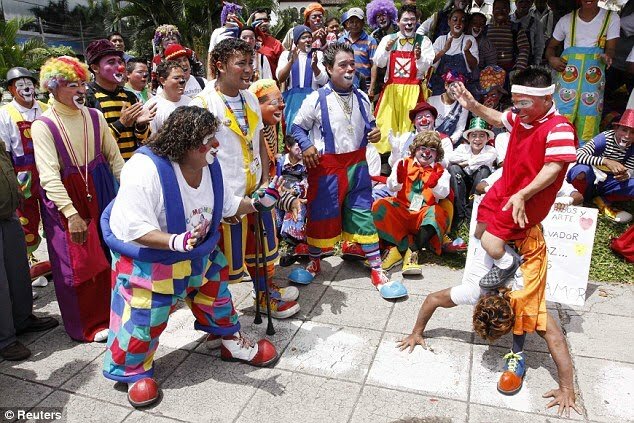 More than 100 professional clowns marched through the Salvadoran capital [on June 9, 2010] to protest against the killing of a bus passenger by two imposter clowns. A man was shot five times in the face and stomach on Monday when he declined to give money to two assailants dressed as clowns who boarded a public bus in San Salvador. No-one has been arrested. Clowns make money by performing on public buses in the city. Wearing oversized bow ties, tiny hats and big yellow trousers, the protesters...marched down San Salvador's main street in an effort to both entertain and educate passers-by. Several held signs insisting that real clowns are not criminals. 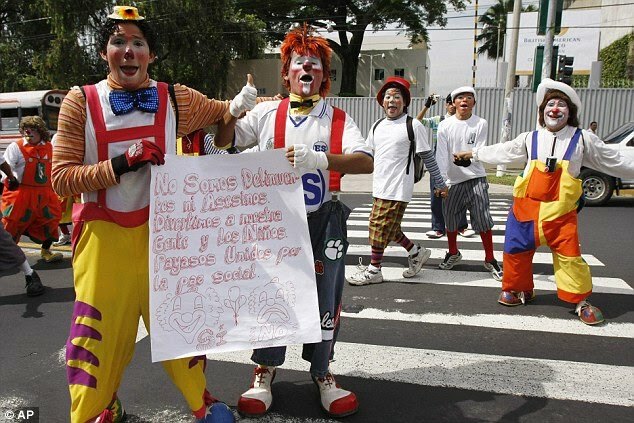 Ana Noelia Ramirez, a professional clown, said: 'We are protesting so that people know we are not killers. Clown union leader Carlos Vasquez said he plans to issue IDs to all real clowns and urged police to detain those who do not have them. About a dozen people are killed daily in El Salvador, murders police attribute primarily to gang members, drug traffickers and other organized crime. More than six million people live in the Central American country. "Killer Clowns" by brownsk8ermm (deviant art). A mass shooting and the shooter's suicide have occurred in the United Kingdom. At least 12 people are dead and 25 are wounded after a gunman opened fire in small, picturesque villages in northwest England on Wednesday morning, June 2, 2010, British police say. The rampage, in a region famed for its tranquil beauty, shocked a country where handguns are banned and multiple shootings rare. It was Britain's deadliest mass shooting since 1996. 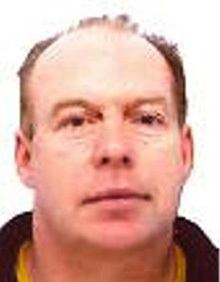 Police have found the body of a man believed to be the alleged gunman, Derrick Bird, 52, a taxi driver described as quiet but friendly. They found the body in a wooded area near the Lake District village of Boot, where it was believed Bird had fled. They also found a gun alongside the body. The BBC reported there had been shootings in 11 locations, not all of them fatal. Witnesses described seeing the gunman driving around shooting out the window of his car. Peter Watson, a witness, told the BBC he had seen a body lying in the road. "When I first got here, it must have just happened. There was a man lying on the ground with police [standing] over him and a jacket on him," he said. Soon afterwards, a farmer was believed to have been shot dead in Gosforth, several kilometres to the east, according to BBC reporter Chris Stewart. "I can't believe he would do that — he was a quiet little fellow."